Gel pens are known for their smooth ink flow and writing ease. The ink (gel) in gel pens is water based and prone to drying out or becoming clogged. As a result, many gel pens do not write long when not used continuously. Follow the steps below to attempt to revive gel pens that have stopped writing. Shake the pen to dislodge any potential air bubbles, and try drawing circles on a plain piece of paper until ink begins to flow again. If that doesn't work, continue to step 2. Unscrew the top of the gel pen that has stopped writing. Use a water dropper to add a drop or two of water to the ink. Shake the pen and attempt to write. If it doesn't work, add slightly more water and try again. Soak entire pen in warm water for 5 minutes as a last effort to revive the pen. 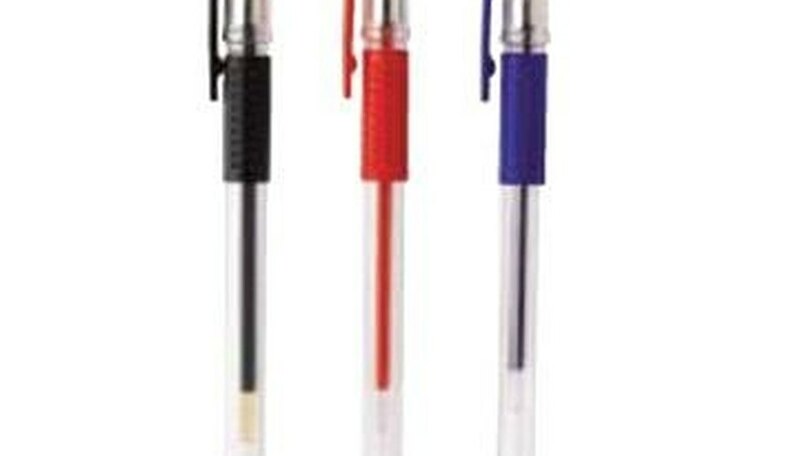 Store your gel pens facing with the tip down and the cap on to prevent them from drying out. Avoid tapping the tip on hard surfaces, as this can cause the ink to clog at the tip.